Find out which inline refrigerator filter we'd choose over all others in our big guide. Many of you will know just how bad the quality of the water that is fed into our homes and when you learn about the many contaminants that we are exposed to if we were brave enough to drink some, it can be quite shocking, to say the least. Chlorine, heavy metals, dust, pesticides, and chromium are just some of the contaminants that can be found in the water being fed into our water mains and along with those will come bad taste and odors as well. Other than buying bottled mineral water, our only other option is to have our water filtered at home whether through a whole house filter, countertop filter or using an inline system on our refrigerators. All of these will provide us with much healthier drinking water but it is the latter that we will be concentrating on in our reviews. We have listed five of the very best inline water filters for your refrigerator that we feel is going to give you the best performance and value for money compared to others on the market. We have tested each over the years as well as dozens of others and are of the opinion which is shared by many others that they are the among the better performing refrigerator water filters in their respective price ranges. So, if you have been considering getting a refrigerator water filter and want to be pointed in the right direction, carry on reading through our reviews. You will also be treated to a buyer’s guide that will show you what to look for if you are planning on doing a bit of your own homework before buying a filter for your refrigerator. See how the big guns compare in the table before reading on to find out how they fare in the reviews. Read about the top refrigerator water filters in more detail now as we take a close look at how each one performs. Our best refrigerator water filter reviews are in no particular order but we thought we would kick things off with the impressive Woder 10k-JG-1/4 water filter, a product that has quickly become hugely popular. It might cost a bit more than most on our list of recommendations but we’re sure that you will feel the price is worth it when you understand the benefits that it can bring to your refrigerators water supply. Meeting NSF standards, the 10k-JG-1/4 claims to be able to eliminate 99% of water contaminants, will supply you with clean tasting water for at least 3-years or 10,000 gallons. Connected to the water supply going into your refrigerator, this model is easy-to-install and will take no more than 15-minutes at most to do so and will last far longer than most other filters. 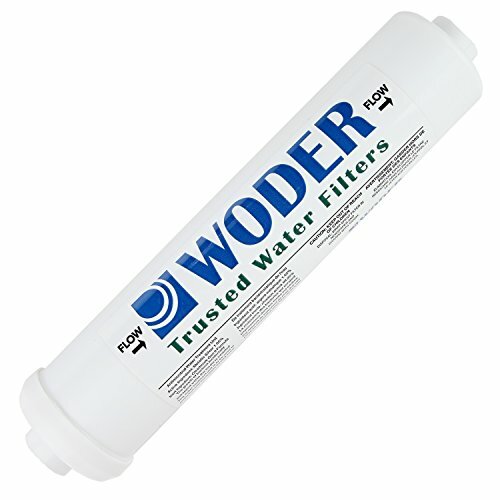 Designed to be used on ¼” connections, the Woder 10k is able to eliminate such contaminants as lead and other heavy metals, chlorine, PFCs, TMHs, VOCs, chromium, and many others. Bad odors will also be removed and the taste drastically improved. So why do we rate this as one of the best inline water filters? Well, many filters will perform close to how this one does in terms of the contaminants removed but we feel this stands out simply because you will not have to replace or change the filter for a good three years at least. Other products will usually give you around 6-months of usage which sounds a lot but when you have to change the filter every six months it can get annoying. Another reason is that installation is quick and easy as long as you are connected to the right sized ¼” connectors. An instruction manual will take you through the steps while you will also find many videos online that will help you too. As long as you have a few standard tools at home, you should be able to have your inline refrigerator water filter within 15 minutes. Being made entirely in the USA will also be a big selling point for many of you and of course, being compliant with ANSI standards should also be seen as a massive positive. Lasts 3 years or for 10,000 gallons of water. 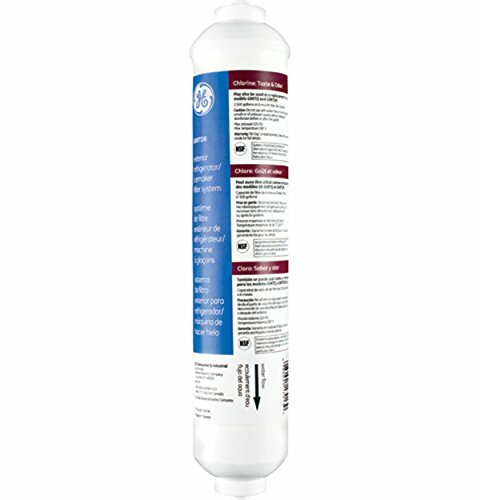 Removes or reduces 99% of known contaminants. Bottom Line: Easily one of the most popular inline water filters on Amazon, the Woder 10k-JG-1/4 system is definitely one that we would recommend you take a closer look at. It offers you the clean and contaminant-free water that you desire and a good three years of it as well. Is it better than the others on our list of recommendation? In a word, yes. Next on our list of recommendations for those of you that are looking for the best fridge water filters is that of the GE GXRTDR. At a fraction of the cost of the previous Woder model, this could be an excellent option if you are looking to save a few bucks without compromising on quality. The quality of the water that comes from our taps is never of a good quality no matter where you live and unless you are going to buy plastic bottles of mineral that harm the environment for the rest of your life, water filters are the only other viable option. There are plenty of these for you to choose from but in our opinion, the GE GXRTDR is easily one of the best refrigerator water filters around. Known for being able to effectively remove contaminants such as sediments and chlorine and is extremely easy to fit your water inline for your refrigerator or even as an under counter filter for your faucet, the GE GXRTDR has become a popular choice for many buyers on Amazon. Another great selling point is that you do not need to own a refrigerator that already has a built-in filtration as many others do. It can simply be connected to the ¼” water line whether to provide filtered and clean drinking water or ice cubes. A reason why this inline water filter is a lot cheaper than the Woder above will basically come down to the fact that it will provide you with six months of contaminant-free water compared to the three years provided by the other model. This is fine though and is quite standard across inline filters in the same price range. You just have to make sure that you purchase new filters so that you can replace them twice a year. You will also be pleased to hear that the GE GXRTDR external water filter for refrigerators is certified by both NSF and ANSI which will give you a peace of mind that the product is providing the great tasting and contaminant free drinking water and/or ice cubes that it states it does. Can be used as an under counter filter too. The filter needs replacing every 6-months. You also have the added convenience of being able to get tasty and clean drinking water straight from your refrigerator rather than having to go and purchase mineral water. Those savings are just one great reason to purchase this water filter but the many others include its ease of installation, and the quality of the water it can produce. Recommended Reading: Don't miss our latest guide to water filter pitchers. The Culligan IC-EZ-1 EZ Inline Water Filtration System is the first of two from Culligan among our refrigerator water filter reviews. In fact, the system for either is able to fit replacement filters from the other as they both use the same interlocking size and head assembly system. The IC-EZ-1 is the cheaper of the two but this is mainly down to what the filter is able to remove from your drinking water or ice cubes that come from your refrigerator. With this filter, you are able to reduce any odors, remove any bad tastes, and more importantly, reduce the levels of chlorine. This is not quite as much as what the more expensive IC-EZ-4 filter can remove but then again that is why it costs more money per filter. Where this model does stand out compared to the others in the range, however, is the fact that it lasts for double the amount of time and will provide as much as six times the amount of clean drinking water. The filter only needs to be replaced once every 12 months and you can get as much as 3,000 gallons of drinking water. This is all delivered with the same flow rate of 0.5GPM that you will find across the board with this range. Along with not having to change the filter for a year each time and getting far more water for your money, you will find it extremely easy to make a change when the time does come to change out the filter. You do not require any tools to change the filter cartridges as they can be twisted on or off within seconds as and when a change is required. Once you do need to change the filter, you do not have to stick with the 1 EZ either, as you can use any of the Culligan IC-EZ range of filters in the head assembly unit. Also, did we mention that you get a two-year warranty with this quality inline water filter? That means that if for any reason it is not performing as it should be or is faulty, you can get a replacement. If you are wondered about just how effective the EZ-1 is, it would not have been independently certified both the NSF and AND if it wasn’t. A breeze to replace filters. Gives approximately 3,000 gallons of drinkable water. Does not filter out as many contaminants as other models. 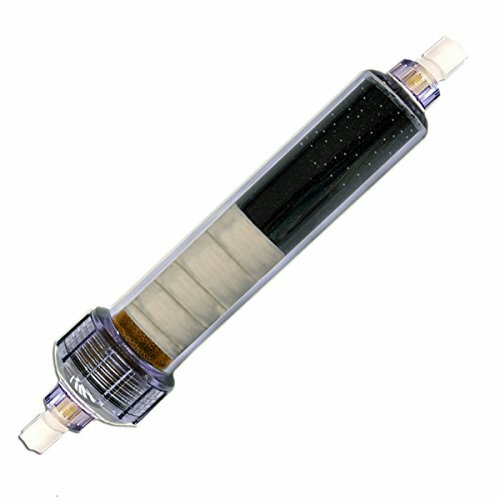 Bottom Line: What we like the best about the Culligan IC-EZ-1 EZ-Change Inline Filter is that even if the EZ 1 filter itself does not get your drinking water as clean as you might hope in terms of the contaminants removed, you can simply load in a filter from some of the other models on the range. They all use the same twist-in, twist-out cartridge locking system. We found this water filter to be excellent value for money and we had no issues with the EZ 1 especially when you consider it is the cheapest in this range of filters. When looking for the best water filter for refrigerators, one of the biggest comparisons will be the number of contaminants that they can remove compared to others. Well, the IC-EZ-4-EZ is the top of the range filter in the Culligan EZ range essentially because it can remove a wider variety of contaminants compared to the others. It can reduce bad tastes and odors just like the other models but will also remove chlorine, chloramine, sediments, lead and cysts, and also MTBE, VOCs and Mercury too. Quite simply, this filter will produce the best quality drinking water or ice cubes out of the whole range. Whether it is worth the extra cost will depend on your own situations and how clean you require your water to be. While most filters on this list meet NSF/ANSI standard 42 (which deals with chlorine removal) and are certified for doing so, this model is actually NSF/ANSI standard 53 certified as well. This means it has passed stringent testing to prove its effectiveness in removing a whole host of contaminants, including lead and mercury. Unfortunately, providing such effective filtration has two big drawbacks. Firstly, it costs above average for one of these models (though priced very competitively), and secondly the water flow rate is quite low (0.3 gallons per minute). Just like the EZ 1, the EZ 4 is incredibly easy to install and when it comes to changing filters, a swapping in and out system makes this a simple process. With this model though, you do have to also consider that you will get up to 500 gallons of water from each filter for six months use, whichever comes first. This is quite a reduction compared to the EZ 1 but many of you will feel this is fine considering the contaminants that it can reduce. Initial installation is very simple too and you do not even need to worry about having any special tools. An instruction manual will guide you through this process in a step-by-step manner and you will also be able to make use of various videos online. Also, much like the rest of the best refrigerator water filters on this list, the IC-EZ-4-EZ has been tested and certified by NSF and ANSI to ensure that they deliver exactly what they should be. Good variety of contaminants reduced. Filters can be changed simply. Filters need to be replaced after 6-months. Bottom Line: The Culligan IC-EZ-4-EZ Inline Refrigerator Water Filter is certainly a step up on the EZ-1 in terms of the contaminants it reduces but it comes at more expense and a big reduction in how much water or ice that it can produce. If that is not too much of an issue for you, however, this is certainly a refrigerator water filter that you should be considering. Double NSF certification puts this model in a league of its own. If you're simply looking for the most effective inline filter out there then this is it. It is simple to install and you do always have the option of using a variety of filters from the other models in the range if you do want to keep costs down at various times. The process of changing filters is incredibly easy too, much easier than many other models you will find on the market. In any refrigerator water filter comparison, you will take in various factors such as price, the contaminants reduced or removed, the life of the filter, and whether they are easy to install. Well, with the CuZn ILFC-200, you are getting one of the more expensive refrigerator water filters that will last a good year before replacing and will remove or reduce a wide range of known water contaminants. In our opinion, the CuZn ILFC-200 will be right near the top of any refrigerator water filter comparison chart for the reasons above. Sure, it will cost a bit more but in your search for the best quality drinking water or ice cubes, this really should not be too much of an issue. The contaminants that this refrigerator water filter can remove or reduce includes chlorine, chloramine, fluoride, heavy metals, herbicides, pesticides, sediment, algae, molds, bad taste, and odors. Whether you want to use the inline water filter for ice maker or drinking water, you are guaranteed to have perfectly safe and clean water. Installation takes just a matter of minutes with a combination of the included manual and a video on the CuZn website being your best friends when you get around to setting it up. Furthermore, you will get around 500 gallons of water per filter or a years use before you need to think about replacing it. You cannot buy replacement filters which is a bit of a concern and will have to replace the whole unit each time. Again though, for the overall quality of water, you will be getting, this is more than worth the extra hassle. That said, many of the other water filters on our list will allow you to simply change out the filter cartridge rather than replacing the whole unit – which might suit some of you better. As you might expect with any inline water filter on our list, the ILFC-200 does come with NSF certification meaning that it meets their standards on what a water filter should be doing. Eliminates or reduces many water contaminants. Bottom Line: While the lack of having the ability to change the filter is something that will push a few away from the CuZn ILFC-200, we really feel that it is still one of the best refrigerator filters that money can buy. This is based purely on the number of contaminants that it can remove and the quality of water that is produced due to this. Installation is very easy compared to most others as well and you will instantly see the obvious build quality of the inline water filter. All in all, this is a great inline water filter and one which we feel should be considered by anyone that is looking to improve the quality of water going into their refrigerator. Any of the five water filters above are certainly worth consideration if you are looking to improve the water quality from your refrigerator. As you will have seen from our refrigerator water filters reviews, they each come with their own pros and cons but at the end of the day, there will be something for everyone among the five we recommend. Of course, with so many good options to choose from, you still have to whittle down which of them would be best for you. If we personally had to pick the best inline water filter for a refrigerator from our list based purely on performance and the quality of water that it delivers, we would have to go with the CuZn ILFC-200 but it would be very close to a couple of others. In terms of sheer value for money, however, the GE GXRTDR would be our choice. No matter which of the above that you choose, we can assure you that they are among the very best available in our humble opinion. We have tested each extensively whilst also taking onboard the many reviews that each has received over the years and while there were some that were mightily close to making our list, we are sticking to our opinion that these will make for the better choice. Buying an inline refrigerator water filter is not as straightforward as just picking one out that seems a decent price and has some good reviews, as there are so many other considerations that you are going to have to think about before ultimately coming to a decision. This is why we have put together a short buyer’s guide that will hopefully show you what you should be thinking about when it comes to choosing the ideal water filter for the refrigerator in your home. You will need to consider things such as the compatibility with your refrigerator, the contaminants it can remove, whether it has been certified, and how easy it is to install among a few others. Take a quick read through so that you are better informed when it comes to making a decision on the ideal inline water filter for your refrigerator. Before buying a refrigerator water filter, it would be a good idea to learn about the contaminants that are currently found in the water mains. Tests can be carried out quite easily using inexpensive testing kits and these will be able to reveal everything that you need to know. Once you know the contaminants that are found in high levels, you will have a good idea of what sort of water filter to look for. Specifically, you will want one that is known for reducing the main contaminants found in your water. We feel that this is probably the most important factor for consideration, simply because you need to find a water filter that will fit your refrigerator. There is no universal one-size-fits-all solution, so make sure you read up and do a bit of research on the types of filters that will fit your fridge. You may be able to get a refund if you find that it will not but at the same tie you may not, so just save your trouble by making sure it will fit before you hand over any money. The good thing about most inline refrigerator water filters is that you do not have to be a plumber or even previously know how to install an inline water filter for a refrigerator to have them installed. Most are quite straightforward and easy to install and are provided with clear instructions. Videos can also be found online for those of you that are still struggling or you could as a final resort just call in a plumber to do it for you. Of course, you will want to consider the ease at which your water filter can be installed as well as how easy it is to change the filter when needs are. You should ideally opt for one that is easy in both respects if you can. Previously, anyone could produce something that looked like a water filter and then claimed that it produced safe water, however, with independent authorities now in place, you can find out if they are telling the truth or not. NSF International and the American National Standards Institute are the two bodies that test and certify water filters, so a particular product has been certified by either or both, there is a strong chance that you will get what you are paying for. Standard 42 deals with the reduction of chlorine, while standard 53 concerns heavy metals like lead and mercury. All refrigerator water filters will have varying amounts of usage attributed to them whether in terms of how much water they will effectively filter or how long the filter itself will last. Most will allow you to change out a filter while others may require the replacement of the whole filtration system instead. Ideally, you will want a filter system that will last at least six months or in some cases, you may find some that can last as long as a number of years. If you are not worried about changing filters a few times or you would instead have one fitted that lasts for longer will ultimately come down to your own preferences. Recommended Reading: Check out our awesome guide to filtered water bottles next! The cost will always be a consideration no matter what kind of product you are buying and as you can see from our above reviews, the price of refrigerator inline filters can range massively. Usually, the more expensive models will provide better tasting water or overall product but you can still find some excellent water filters that are a fraction of the cost. Ideally, you will want to stick to your budget and get the best water filter that you can afford. Do remember that some will incur additional costs such as replacement filters when the time comes, so you should definitely factor that in as well. It is always nice to know that you have a certain amount of protection should your water filter not be working as it should be. A warranty will give you this protection should you receive faulty goods or it was to stop functioning properly after a certain period of time. Generally, the longer the warranty, the more confident a manufacturer is in their own product, so you should always try and secure a water filter that has a decent warranty period that will see it replaced or repaired should it suffer any kind of problems. Once you have considered all of the above, you should be a lot closer to knowing exactly what you need and want from your refrigerator system. You can then filter down your options by reading reviews on the product before then deciding which of them is the best overall choice in terms of your budget and the end product that you will be hoping to get. The five we recommended are the best of the bunch in our opinion but we would still expect you to do a little homework for yourself as we might have missed one that is more suited to your own needs. Thanks for reading. We hope you've found this guide useful. Make sure and follow us on social media and leave a comment down below. Don't miss our guide to alkaline water pitchers next!